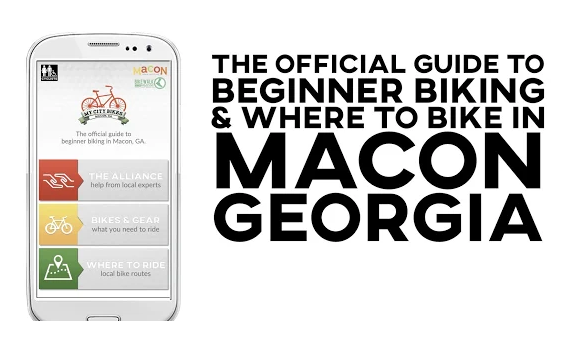 The Macon Bike Share Program provides Macon residents and visitors with a convenient, affordable and healthy way to get around the city. 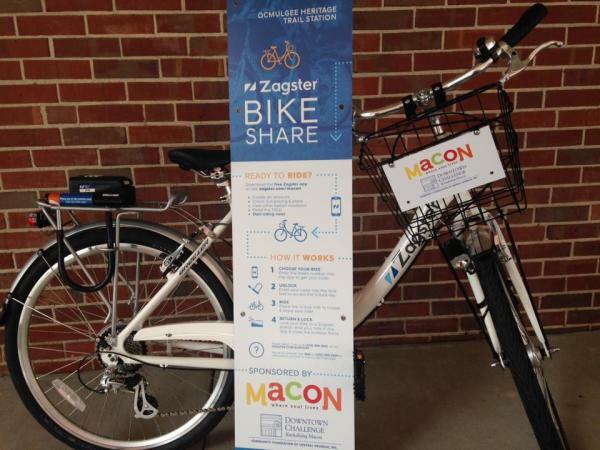 Zagster cruiser bikes are available for rental at stations located at Washington Memorial Library and Tubman Museum. The first hour is free and every hour after that is $1. See below for a map of the bike locations (click map for a larger image), rental guidelines & instructions on how the bike share stations work. Washington Memorial Library: located at 1180 Washington Ave., the bike rack is near the entrance of Washington Memorial Library adjacent to the parking lot. Tubman Museum: located in Downtown Macon at 310 Cherry St., has a bike rack at the front entrance. Ocmulgee Heritage Trail bike rack is no longer active. 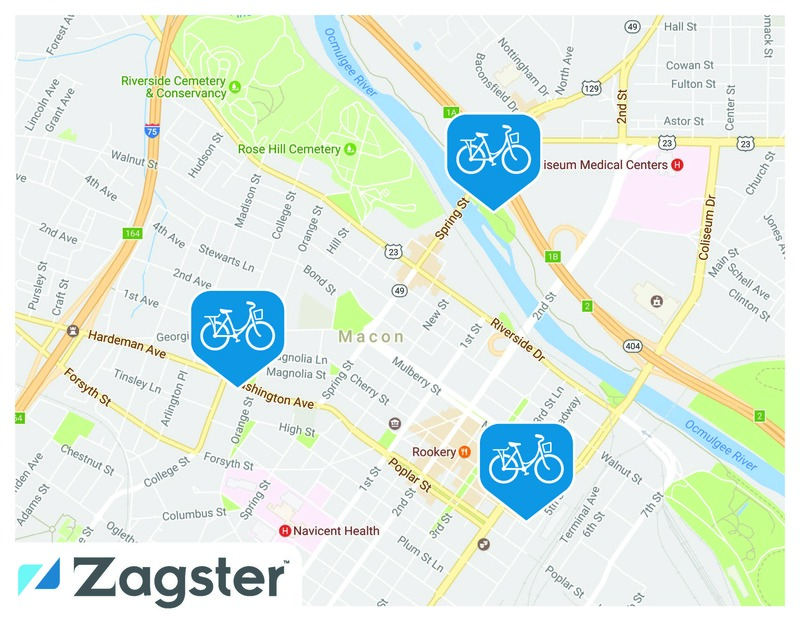 Ride with Zagster from Zagster on Vimeo. Explore Macon al fresco and discover why it&apos;s more than just a place on the map. Happy trails! 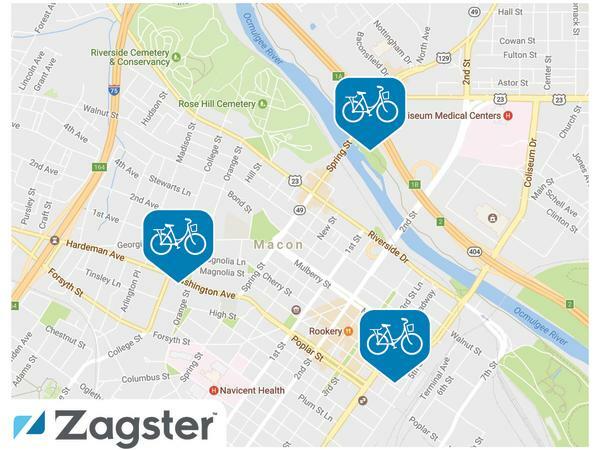 For more information, go to zagster.com. We have launched our local bike app and self-guided bike tours. The tours are short day routes including historical sites, musical landmarks, iconic architecture and haunted halls. Click below to find out more about the routes. The Best of Macon Bicycle Day Tour will take you to an impressive lineup of our city&apos;s incredible historic buildings and public art. From our gothic cathedral to monumental neoclassical architecture to antebellum homes to inviting parks, riders will discover centuries of history right here in Macon. Ride if you dare! This spooky tour will take you to some of Macon&apos;s most infamous haunts. You&apos;ll see majestic architecture and learn about some of our most impressive historic landmarks...and you might even encounter the mischievous and mysterious spirits that are said to dwell here. 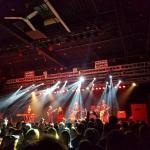 For more information about Macon’s Ghosts please visit gatewaymacon.com.